Water is everywhere. The water molecule displays enormous structural complexity in its condensed forms including the highly anomalous liquid phase, seventeen crystalline phases of ice, at least two families of amorphous ices, and stacking-disordered ice, which displays crystalline order in only two dimensions. Many of the properties and behaviors of these exotic ices remain mysterious, but Halina Tran and co-workers in the research groups of Peter Hamm, and at University College London and the University of Groningen recently provided new understanding. They analyzed how water molecules interact with one another in three types of ice and found the interactions depended strongly on the orientation of the molecules and the overall structure of the ice. The researchers describe their results in The Journal of Chemical Physics, from AIP Publishing. 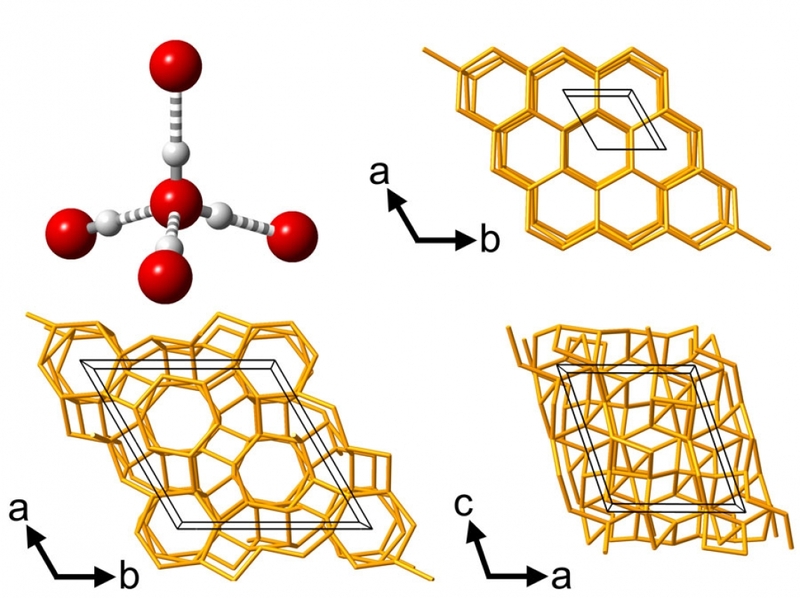 "The new work has given us spectacular new insights on how water molecules behave when packed in dense and structurally complex environments," said Christoph Salzmann of the University College London. "Ultimately, this knowledge will enable us to understand liquid water as well as water surrounding biomolecules in a much better fashion." Water is, of course, essential for life as we know it. But it's also unique due to its bent molecular shape, with two hydrogen atoms hanging off an oxygen atom at an angle. The overall molecule has an electrical polarity, with positively and negatively charged sides. Because of these properties, water molecules can fit together in a variety of ways when solidifying into ice. As water typically freezes on Earth, the molecules assemble into a lattice with structural units shaped like hexagons. But at extremely high pressures and low temperatures, the molecules can arrange themselves in more complex ways, forming 17 different phases -- some of which may exist on the icy moons of the outer planets.